You can save EndNote in a different location on your computer, but do not save your library to cloud storage (e.g. Dropbox, Sharepoint, Google Drive and iCloud, etc.). EndNote is not compatible with cloud storage, and your library may become corrupted. Also avoid sharing your library on a shared network as EndNote only alows one user to open a library, add, or edit records at one time. 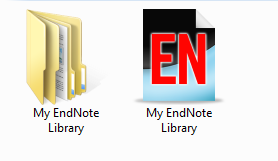 When you create an EndNote library, you are creating two files. These two files must be kept together for your EndNote library to work properly. If you copy or move your library, keep these two files together. One file is a .enl file. If you double-click on your .enl file, it will open your EndNote library. If you only have your .enl file, then your library will have difficulty opening. Follow these instructions to recover your library or contact an EndNote librarian.